Macroalgae, commonly called seaweed, tends to outcompete coral on reefs unless it's kept in check by herbivores. As a result, the amount of herbivory on a reef is a strong factor in determining whether the site will be a coral reef or a field of seaweed. 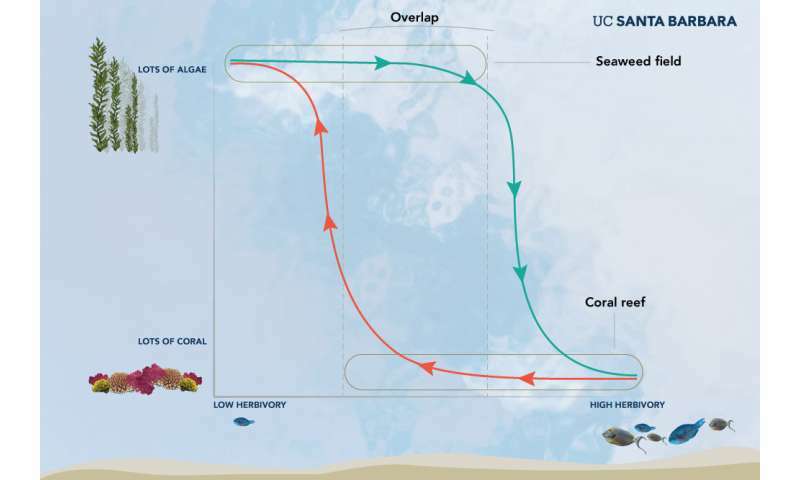 "Reefs in many parts of the world have switched from corals to seaweeds, and the question is what keeps the reef dominated by seaweed rather than returning to coral," said Professor Sally Holbrook of UC Santa Barbara's Marine Science Institute (MSI), one of the paper's coauthors. 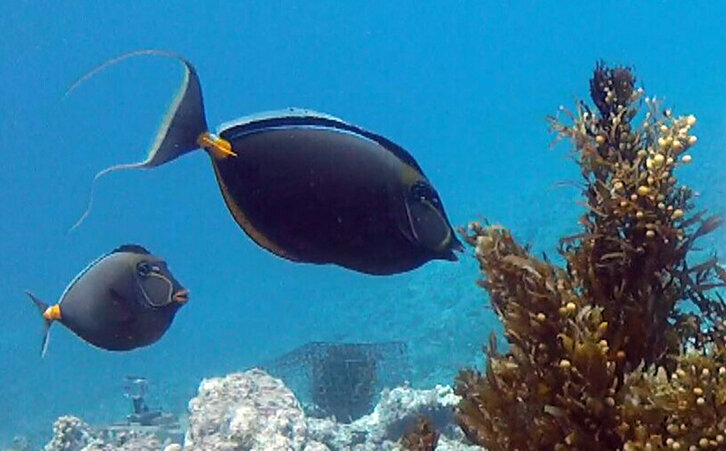 The researchers decreased herbivore activity to different levels by caging off certain areas of the reef so fish couldn't get in to nibble at the algae. They set up cages about the size of a toaster-oven, in groups, on areas that initially either had or didn't have seaweed. Each group had cages with a variety of hole sizes that created a gradient from sites scarcely accessible to any herbivores, to those that accommodated all but the largest algae eaters. "We found it takes far more herbivory to remove seaweed than it does to prevent it," said lead author Russ Schmitt, also with MSI, and a professor in the Department of Ecology, Evolution and Marine Biology. 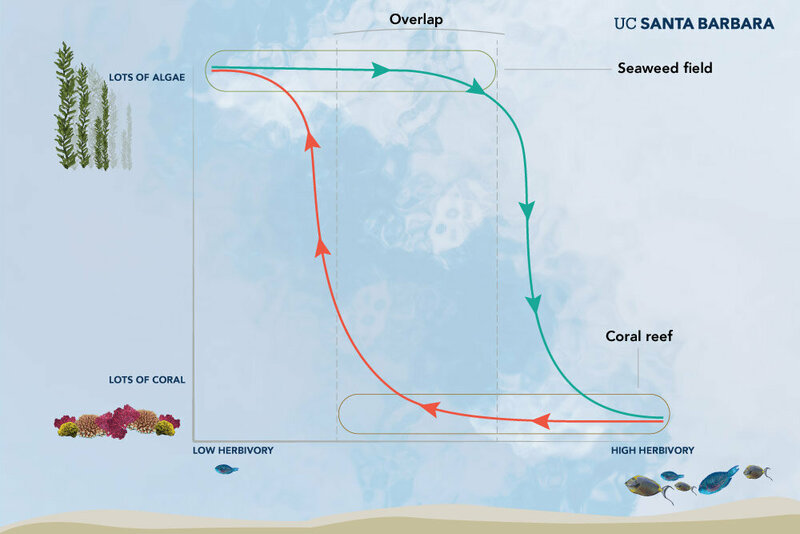 "This means there's an amount of herbivory where the habitat could persist either as a coral reef or as a seaweed-dominated reef depending on whether the community started out as coral or seaweed. Nothing else has to differ." Since the experiment spanned several years, the team was able to demonstrate that their results held over multiple generations of seaweed. "This is the first time that a field experiment has shown it's possible for two different, persistent communities to exist under the same conditions on a coral reef," said Schmitt. And the results are more than academic. 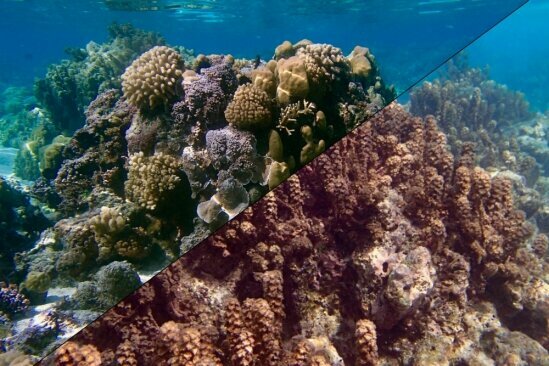 "One reason this finding is important is that it suggests a big shock to the reef can flip it from coral to seaweed without any change in the amount of herbivory," said coauthor Samantha Davis, the undergraduate research programs coordinator at the university's Center for Science and Engineering Partnerships. "And once flipped, the reef then will stay dominated by seaweed." MSI Research Scientist Thomas Adam, another of the paper's coauthors, agrees. "The flip is hard to reverse because only a very large disturbance might cause the reef to return to coral," he said. "Our second field experiment tested this idea." This dynamic presents two challenges for conservation. First, it demonstrates that restoring an altered system to its previous state—like rehabilitating a seaweed-covered lagoon into a thriving coral reef—is more difficult than simply maintaining a community in its initial condition. Second, it suggests that even a seemingly healthy ecosystem could be vulnerable to dramatic shifts in its community. 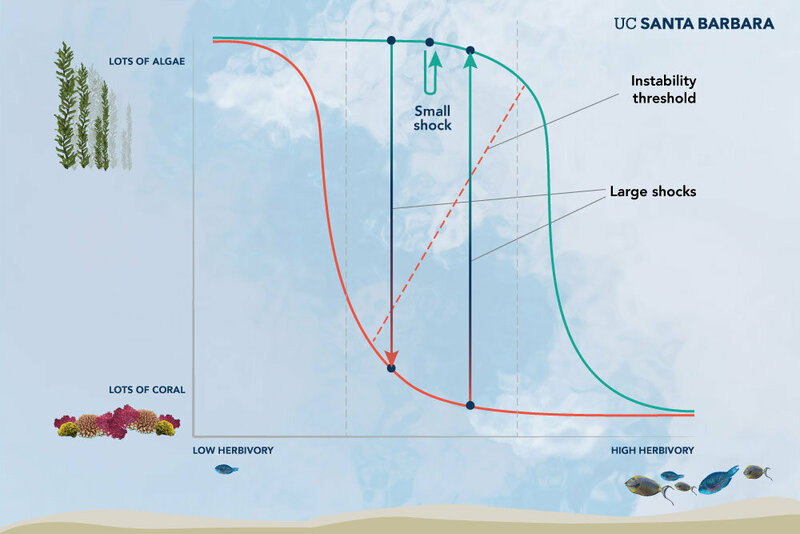 Without changing the conditions on the reef, a large enough jolt to the system could shift an ecosystem into another state, where it will then remain trapped. Fortunately, the study's methodology itself offers a powerful tool for determining how vulnerable an ecosystem may be to switching from one state to another, as well as for assessing how difficult it may be to reverse such a switch. "The methods that we developed provide a roadmap for assessing where an ecosystem lies on an environmental gradient—in our case differing levels of herbivory—in relation to a tipping point where the ecosystem may flip from one persistent state to another," said MSI Project Scientist Andrew Brooks, also a coauthor. It also allows them to determine whether this tipping point lies in a region of bi-stability. "Coral reefs are slipping away," said Dan Thornhill, a National Science Foundation Long-Term Ecological Research program director. "We're seeing a global shift from vibrant coral reef ecosystems to seaweed fields. 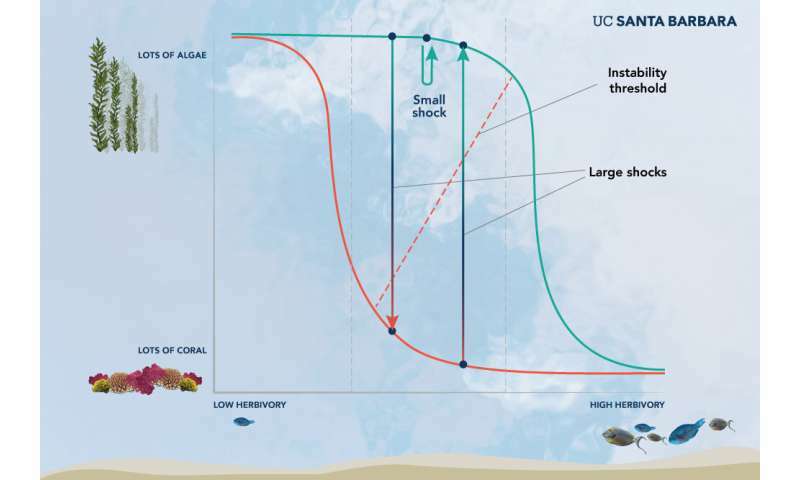 But these scientists show that under the right conditions, reefs can rebound from disturbance."